According to Deloitte, 2017 could experience another “tipping point” in ecommerce—thanks to the “ambitious growth agenda” of stores operating solely online. As a result of this, the physical retail store of today is having to be “reimagined for the digital consumer”, and is likely to focus on either “inspiration or convenience” in 2017. But could ecommerce marketers be doing anything to help the health of its physical counterparts? And we’re not just talking about brick and click retailers, but also pure play brands promoting pop-ups, studios and more. A quick scan of our inbox tells us that, actually, many brands already are (albeit some much more than others). Listed below are five ways retailers are using online marketing to drive offline footfall, starting with a few simple tactics before moving onto more data-driven hacks. 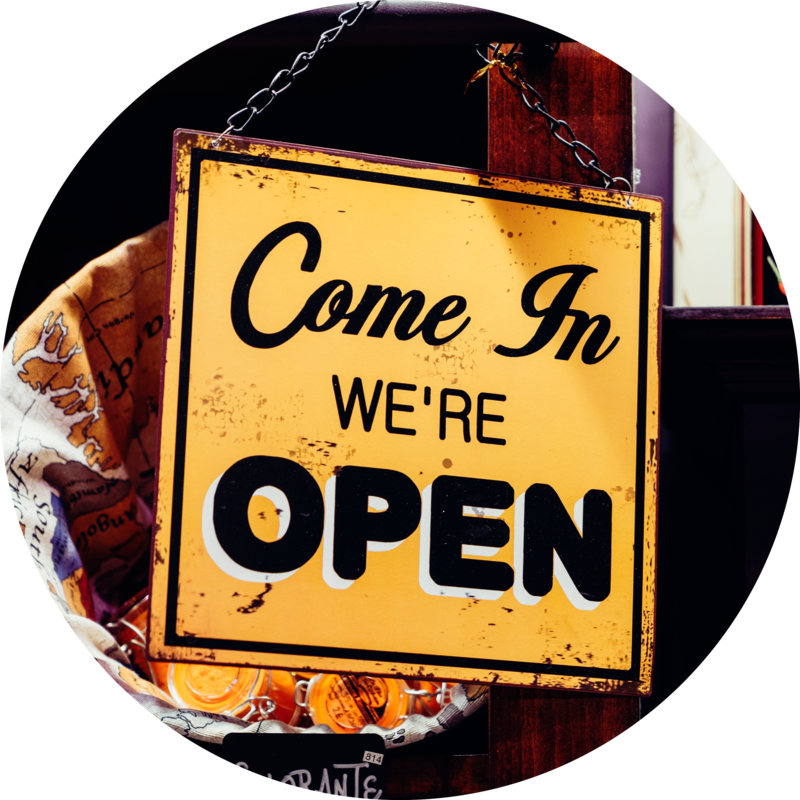 If your brand is tight for time and data starved, or wants to focus mainly on ecommerce for the time-being, there are little ways you can still market your offline store or popup without breaking the bank. Last year, independent clothing brand AYR (standing for All Year Round) opened its first retail pop-up just a few blocks away from its HQ design studio in New York. The wording of the two CTAs in this banner—‘let’s play dress up” and “come hang”—cleverly position the NY popup as a place to socialise and have fun, as well as shop. This highlights the fact that, whilst ecommerce shopping may be more convenient and quick, offline shopping offers an experience that may not be found online. Another simple but effective way retailers are fusing the online/offline experience is by offering (and promoting) a click and collect service. This relatively old practice, which sees a consumer purchasing online but collecting in-store, is particularly effective for those keen to first check their purchase in-store in case there is a problem. 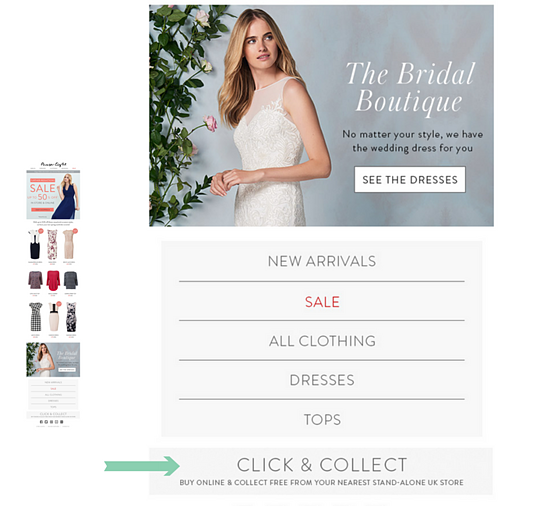 Phase Eight is one brand spreading the word about its click and collect service, using a prominent CTA in the footer of its email template to do so. As effective as they may be, all of the above examples are relatively generic and untargeted ways of encouraging offline store visits. One way to make your offline promotion even more effective is to enlighten a subscriber or website visitor to their nearest store. 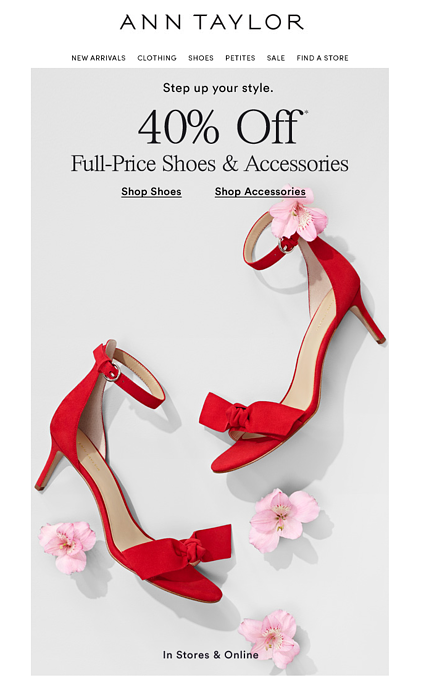 Womenswear brand Ann Taylor is one of the many brands encouraging its email subscribers to find their nearest branch via the CTA “Find a Store” in the navigation bar of its newsletter template. 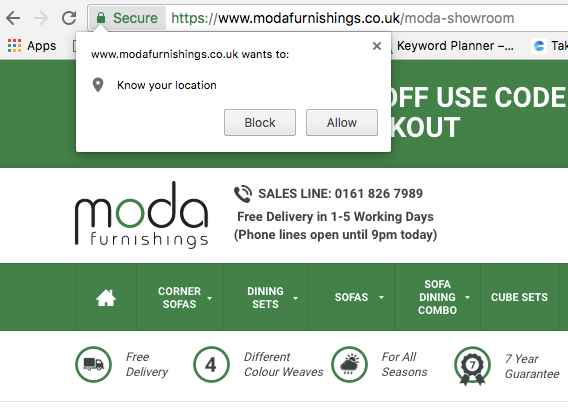 An embedded store-locator is a simple tactic, however a surprising number of brands still don’t use them in their email marketing. Not only does a store locator enable your customers to discover where their nearest store is, but also enables you as a brand to gather important geographic data. But store-locators aren’t the only way to point your contacts in the direction of your offline stores. 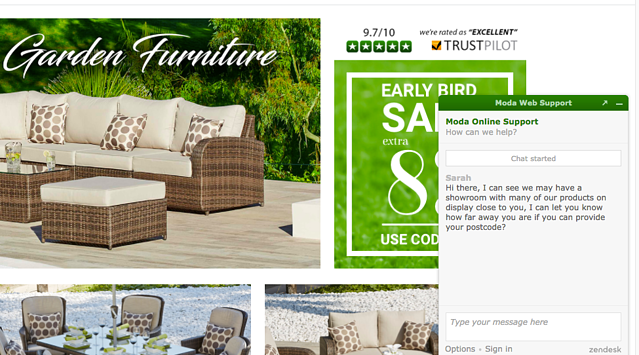 Together, these two marketing techniques enable Moda Furnishings to gather or clarify geographical data, and cater marketing messages according to each recipient’s proximity to one of their showrooms. 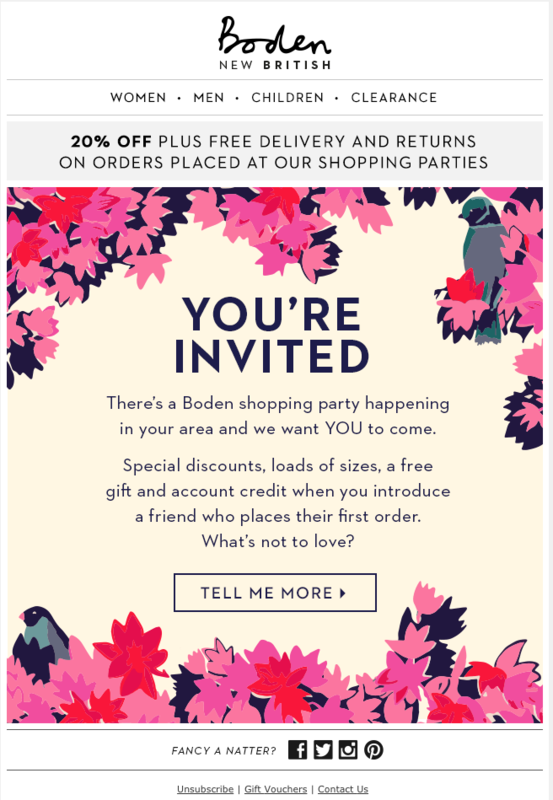 In the email below, British label Boden uses geographic data to invite a segment of subscribers within a specific area to a local event. Through the use of the personal pronoun “you” in “your area” and “we want YOU to come”, the event appears more exclusive and the invitation more personal —this is likely to make a recipient feel more special and therefore more likely to attend. 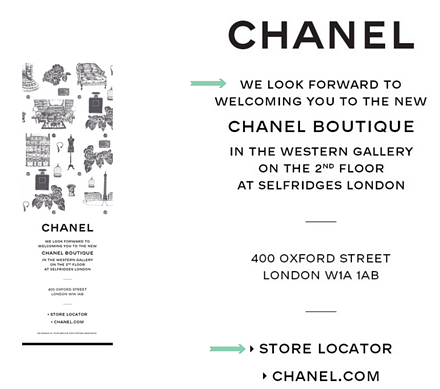 Chanel is another brands using data to send geo-specific mail outs encouraging contacts within a certain area to check out a store. 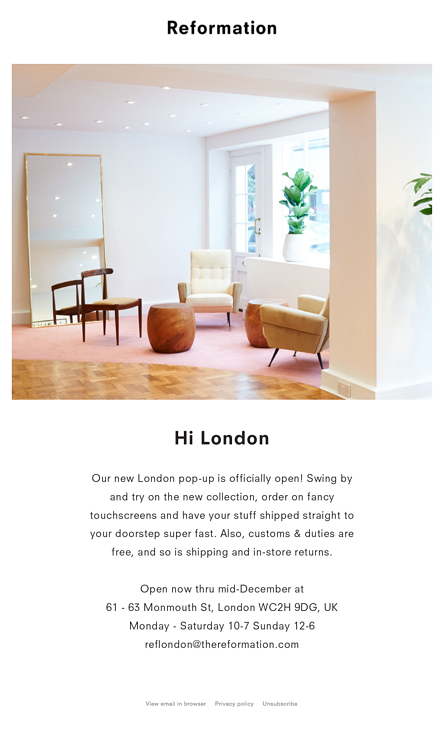 In the example below, the iconic French brand invites a London based recipient (me) to its new boutique in Selfridges, with a cheeky store-locator in tow. Up next in the online/offline love story comes printable vouchers. 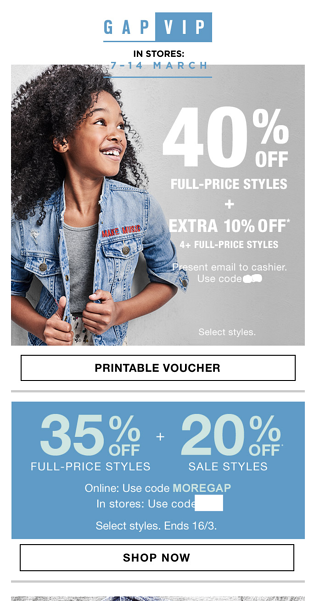 This email from Gap is particularly interesting because its main focus is its in-store sale (promotion for its online sale is only mentioned towards the bottom of the template). Moreover, the discount for the in-store sale is greater. 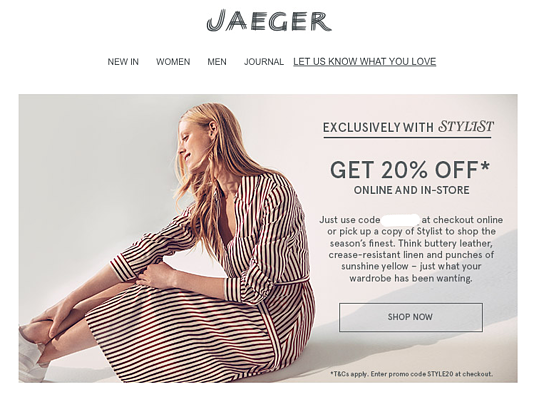 In the example below, Jaeger teams up with Stylist magazine to concurrently encourage more people to pick up the publication and direct more people to its stores. Back to Ann Taylor! As well as having a store locator functionality (mentioned at the start of this post), it also uses its email marketing to cross-promote its online and offline sale. We've just talked about reaching out to consumers either remotely or based on their postcode. But what about using more micro-based technology (i.e. GPS) to send shoppers relevant upates in real-time, when they are actually in or walking past a store? This time last year we reviewed the Regent Street App—a mobile app using Beacon devices (devices placed in stores) to push personalised messages and special offers to consumers mid-shopping. According to David Shaw, the head of The Crown Estate’s Regent Street Portfolio, the idea behind the app was to bring together online, physical and mobile retailing by creating “an experience which delivers across all of the platforms that appeal to 21st century shoppers”. 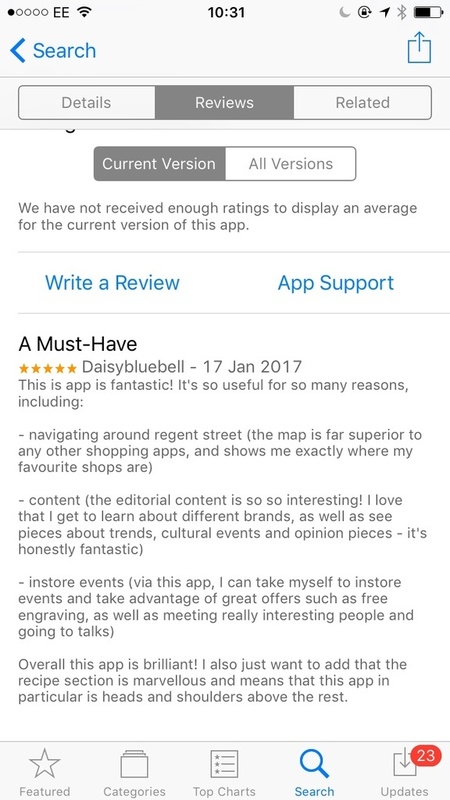 As you can see, the app is praised for its ability to help shoppers navigate Regent Street, and notify them about any exciting in-store events. And having checked out the app for ourselves, it is looking pretty personalised. Other examples of brands using apps and push notifications to enhance the in-store experience includes Rebecca Minkoff. A few years ago, the innovative, famously tech savvy retailer partnered with eBay to create a "digitally connected store" and an app that would allow shoppers to: use an interactive mirror/touchscreen, order drinks, save items, find product recommendations and receive discounts at the checkout. According to research carried out by PwC and The Local Data Company, in the first six months of 2016 over 2,000 shops closed on Great Britain’s high streets—a rate of 15 stores a day. But is it really all doom and gloom? We don't think so. 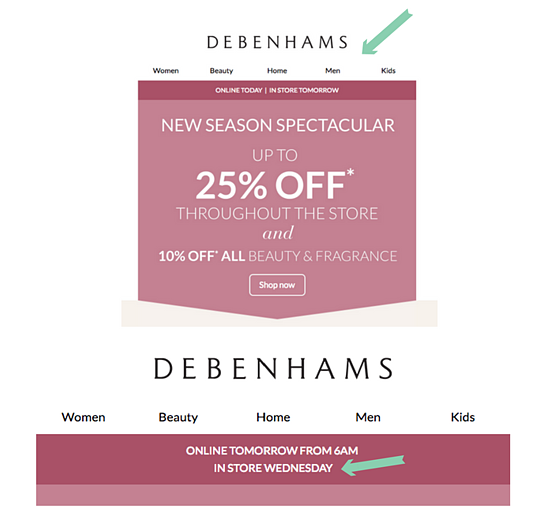 Today, thanks to dynamic content, online marketers all over the world can send bespoke marketing messages to their entire contact list reminding them of their nearest offline store (and/or updating them on any sales or events taking place at that store). And thanks to cutting-edge technology, retailers can use apps and push notifications to enhance a shopper's in-store experience. In other words, whilst ecommerce threatens to kill brick and mortar, it also has the potential to save it.